… is all that matters here! Wanting something unusual, unique, sumptuous for a friend or loved one for a special occasion and know they’d love a piece of wearable art? 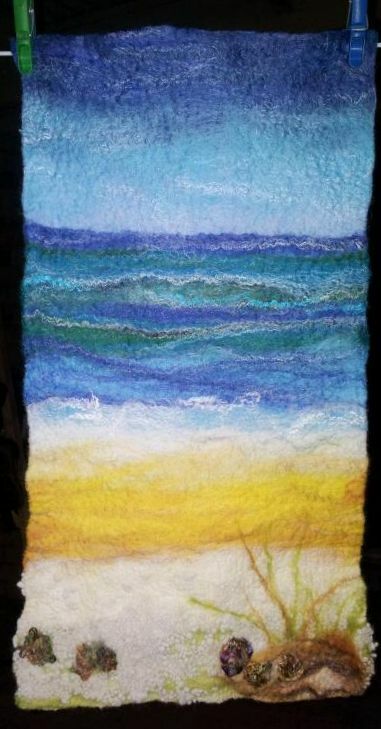 Or a stunning felted wall hanging? Or quirky felted bowl or other unique item? Blue network scarf with lots of hand dyed silk – hankies, tops, chiffon and dimensional yarn. Blues, turquoise green. Red network scarf with lots of hand dyed silk – hankies, tops, chiffon and dimensional yarn. Reds, oranges, maroon. 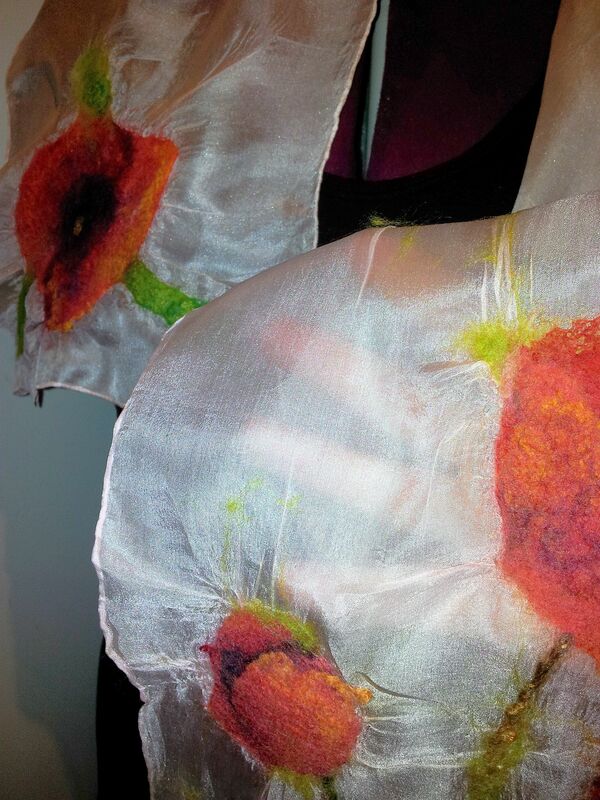 Hemmed soft, drapable nuno felted silk scarf with poppies at either end. 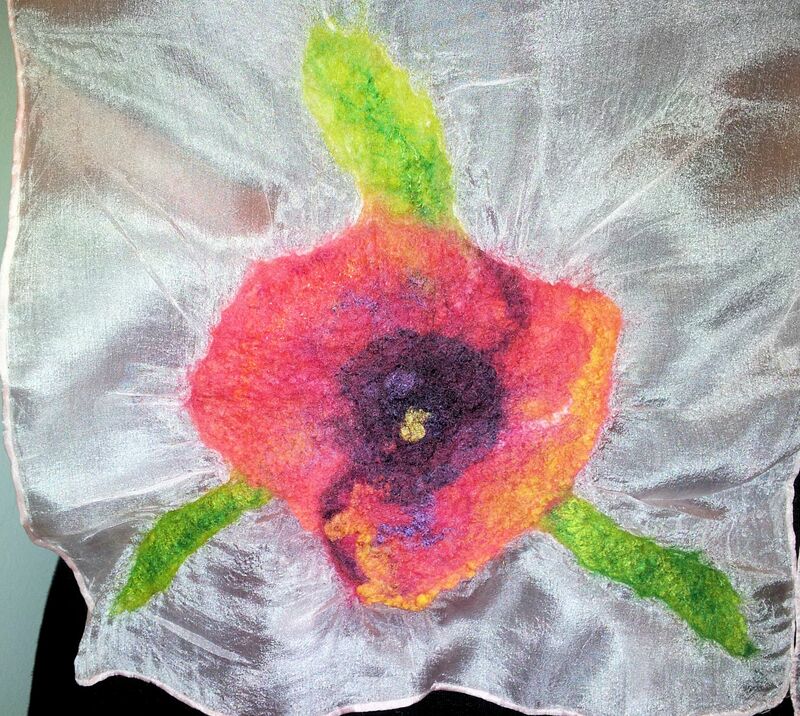 Iris inspired summer flower scarf nuno felted with 15micron merino and hand dyed silk hankies and silk tops felted onto tissue silk. Blues, greens. Poppies! 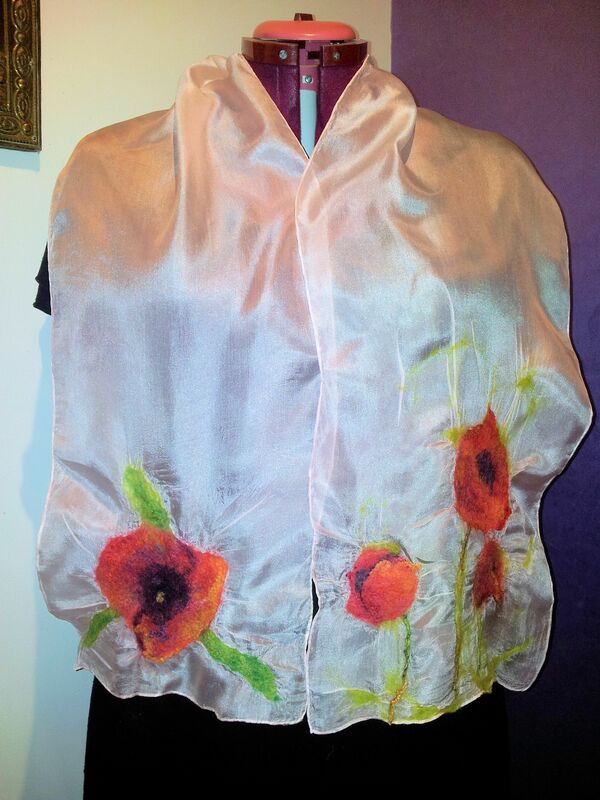 Nuno felted summer scarf with tissue silk, merino wool, silk noile, silk tops, silk hankies. Jewellery made with hand-made felt roll, embroidery and beading. Jewellery made with hand-made felt “bead”, embroidery and beading. Jewellery made with hand-made felt, embroidery and beading. Jewellery made with hand-made felt balls, and beading. 3D rose brooch drying on a rack in the kitchen. Diptyche of poppies. Wet felted with beading. Completed wall hanging, with added details in embroidery and needle-felt. These colours remind me of the beach! Various felted goodies. Ensure your gift is ready for Christmas! Now is a good time to put in your order for a commissioned scarf or other piece of felt art. As these are hand made items, and each piece takes several hours to make, if you order now you can ensure your order will arrive in time to gift it at Christmas. If you let me know which out of the scarves or other items you’ve seen on this blog that you like, and give me an idea of the colours or style you are after, I will do the rest! There are felted gifts to suit your budget – from $5 plus P&P to $500 plus P&P. I would love to help you with the ideal gift! Contact me today using the contact form below and we can arrange that extra special one-of-a-kind gift. If you landed on this page from my website and would like to return, please click here. I was fortunate enough to meet a textile artist the other day who told me where to source hemmed silk scarves in Australia. I liked that idea because during our summer months the heat and humidity does make the wool on the edging of even my summer scarves a tad warm. Using hemmed scarves means I can still felt beautiful details and pictures onto the silk, but without ‘hemming’ with wool along the edges to prevent fraying, as I have done up until now. Of course, I still love my tissue silk and will continue to purchase that as well, because the effect you can get on this lightweight material is gossamer fine. The hemmed silk scarves I have just obtained are slightly less open weave than the tissue silk, but when I opened the pack, I blew through one and knew that with a tad more rubbing, I could still felt it. These scarves are gorgeous, with such a sheer lustre to them, I couldn’t wait to felt onto one. 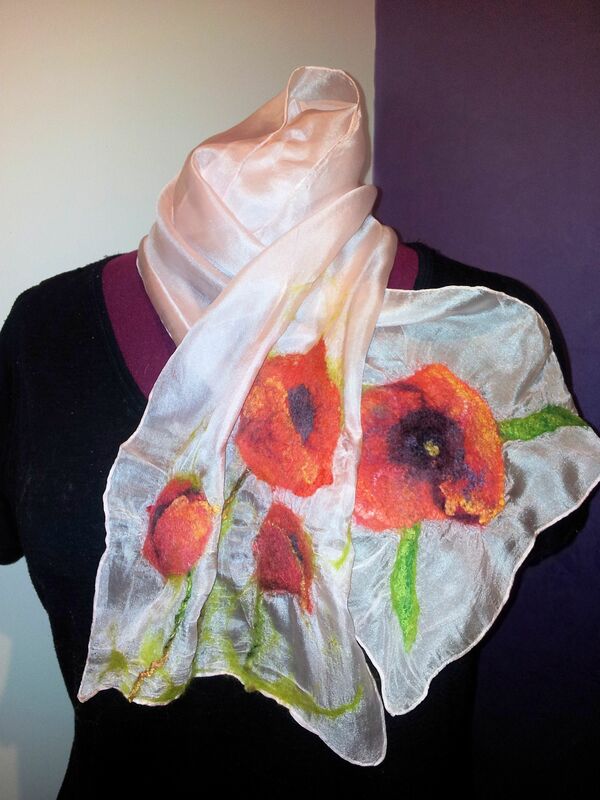 This morning I set about another poppy scarf as I loved the effect of the original one I made recently. This one is a slightly different design but still uses fine merino wool as well as silk hankies and tops along with a little Angelina fibre to get that glow that brings light-catching properties to the matt of the wool. Gawd, I love textile art! I figured wispy merino would probably migrate more through the netting during felting than onto the scarf, so I used prefelt pieces ‘stuck’ down with merino rovings, and with the wool and silk details applied on top. I was right about needing to work it harder, but I reckon the finished effect is well worth the effort. 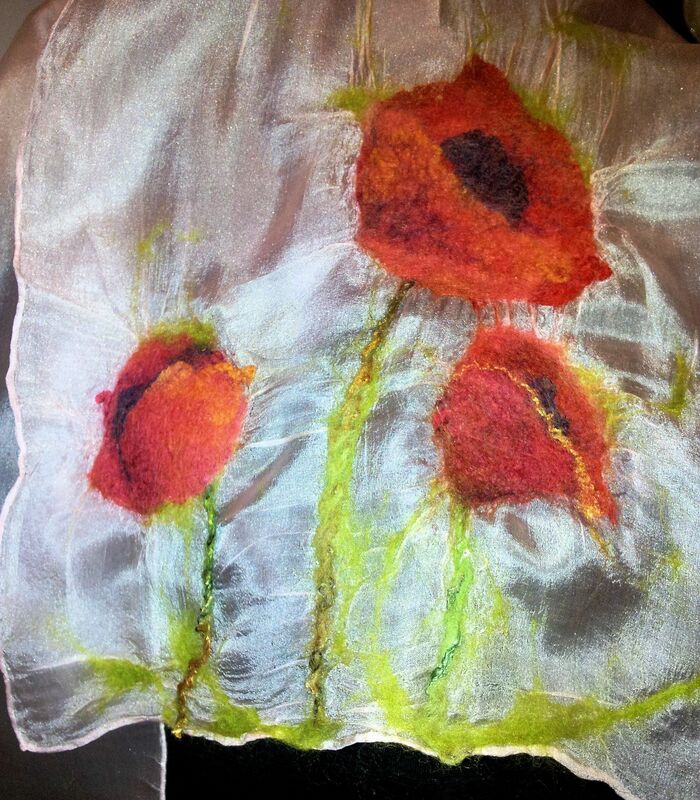 During the felting, some of the red dye from the hand-dyed wool transferred to the white silk scarf, giving it a delicate hint of palest red, which works very well with the bold reds, black and green of the poppies. Hemmed silk scarf so sheer you can see my hand through it! The finished scarf is gorgeous! It’s lightweight, sheer, lustrous and has a lovely tailored look with the hand hemmed edges and the felted poppies at each end have a painted effect that I love. I will definitely be felting the others in a similar way. I reckon this will make someone a delightful Christmas present. It is one of a kind, and art in textile as well as sumptuous materials, sheer for Australian summer yet warm for winter – that’s the beauty of silk. Reflections, revelations and proposals esoteric: Themes to elucidate the depths of human potential. I make therefore I am. ... is all that matters here!